A First: Uterus Transplant Gives Parents A Healthy Baby : The Two-Way The new mother, 36, had been born without a uterus, so another woman, 61, donated her womb several years after she had gone through menopause. 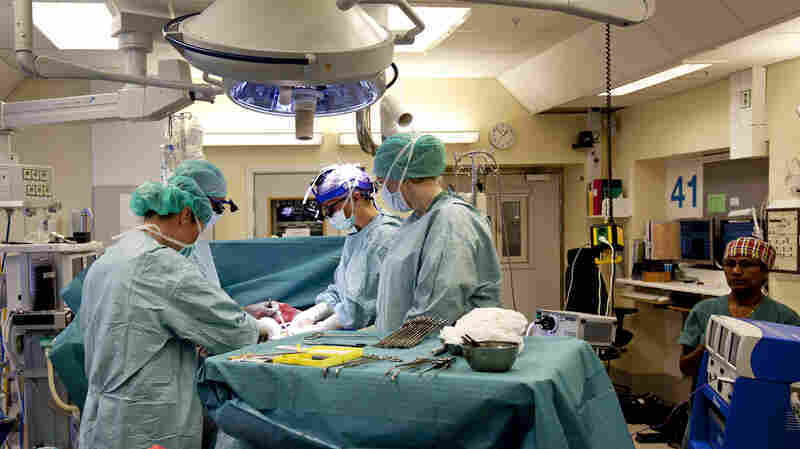 Dr. Mats Brannstrom and his team perform a womb transplant operation in April. Brannstrom says they delivered a healthy baby boy to a uterine transplant recipient last month, a first in medical science. The successful birth was reported by Dr. Mats Brannstrom of the University of Gothenburg, where a research program has performed uterine transplants on nine women. The program's findings are being published in the British medical journal The Lancet. "The recipient had intact ovaries and was able to produce eggs, which were then fertilized using IVF" before the transplant, NPR's Patti Neighmond reports. "The resulting embryos were transferred to her uterus. Doctors were concerned about compromised blood flow to the fetus, but it turned out blood flow was normal." The baby was delivered by cesarean section in September, after his mother developed preeclampsia in the 31st week of the pregnancy. He was sent home 10 days after being born. "The baby is fantastic," Brannstrom tells the AP. "But it is even better to see the joy in the parents and how happy he made them." The parents haven't been identified, but the AP spoke with the baby's father, who said of his son, "He's no different from any other child, but he will have a good story to tell." The parents will have to decide whether they want to try for another baby. During pregnancy, the mother took "triple immunosuppression medications (tacrolimus, azathioprine, and corticosteroids)," according to the Medscape site. To avoid long-term damage from those medications, the BBC reports, they'll need to either try for another pregnancy or have the womb removed. On their web page about the uterine transplant project, the researchers say, "Five of the donors are mothers of the receivers; the remaining four a close relative." The researchers say that a live-donor uterus transplant is "low risk despite extended surgery duration," with donor surgeries ranging from 10-13 hours. Of the nine women who received the transplants, two later had to have the procedure reversed, in one case due to blood clots and in the other due to a chronic infection. The idea to transplant a uterus first came from a patient, Brannstrom said in August. Recalling a conversation that took place back in 1998, the doctor said he had removed a woman's uterus as part of treating her for cervical cancer. Brannstrom then explained to the woman that she still had ovaries, egg cells and hormones — but wouldn't be able to have a baby. "But isn't it possible to transplant a uterus?" the woman asked. "My mother or older sister could give me a uterus." "This patient is mad," Brannstrom recalls thinking. But he talked about the prospect with other doctors, and another transplant breakthrough the same year — that of a human hand — made him start working toward making the idea into a reality.